Funding Could Dry Up For Kentucky's Noah's Ark Theme Park : The Two-Way Answers in Genesis, the nonprofit building the park, has fallen short of its fundraising target and must raise $29 million by Feb. 6. 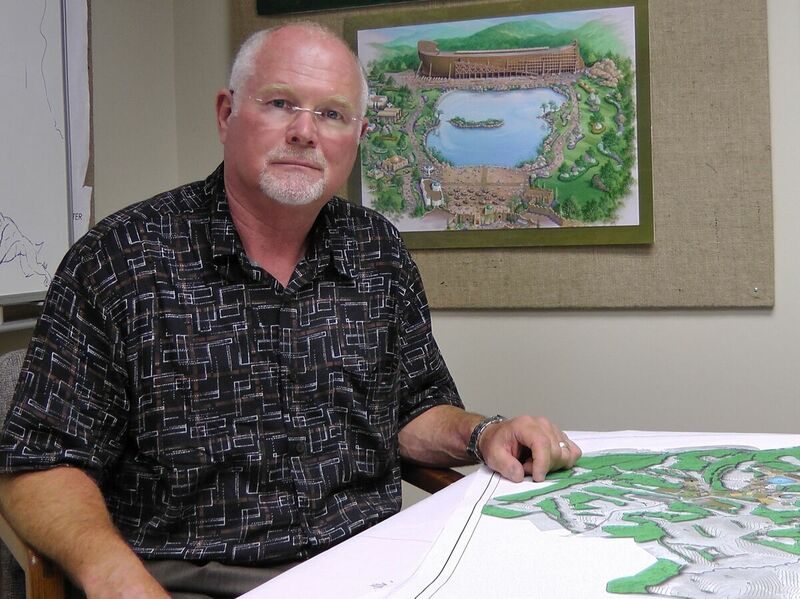 Mike Zovath, co-founder of Answers in Genesis ministries, poses for photos at the Ark Encounter headquarters in Hebron, Ky., in July 2011. Plans for a Christian theme park in Northern Kentucky featuring a 510-foot-long replica of Noah's Ark are likely to sink unless the project raises millions of dollars from investors in the coming weeks. The Courier-Journal reports that the project, undertaken by the Christian non-profit Answers in Genesis, has sold unrated municipal bonds worth $26.5 million, but needs to sell another $29 million by Feb. 6 to avoid triggering redemption of what's already been sold. "We still need those Ark supporters who weren't able to purchase the Ark bonds at closing to prayerfully consider participating in a secondary bond delivery at the level they had indicated to us," Answers in Genesis President Ken Ham wrote in an email to supporters on Thursday, according to the newspaper. "The associated complications and struggles have been beyond our control," Ham wrote, citing impediments such as atheists registering for the offering and disrupting it, according to the newspaper. The $150 million project has been plagued by delays since it was unveiled in 2011. It was originally slated for completion this spring, when $37 million worth of tax breaks offered by the state are set to expire. Now, with construction still not started on Ark Encounter, the earliest it could be finished is 2016, AIG says. "The project has drawn comparisons to tourist attractions from Alabama to Nebraska that have defaulted, and comes with the added risk of legal challenges because its religious theme may violate the Constitution. The Washington-based group Americans United for Separation of Church and State said it is monitoring the project." "Industrial-development bonds are considered the riskiest municipal debt because they account for the largest proportion of defaults in the $3.7 trillion municipal market. Williamstown issued the bonds without a rating, making the prospect of repayment even less clear." "The first phase is estimated to cost $73 million, offering documents show. About $14 million had been raised before the bond sale, which was supposed to make up the difference." In 2007, Answers in Genesis opened the Creation Museum in Petersburg, Kentucky, which offers museum-goers a so-called "young Earth creationist" perspective, teaching that the Earth is only about 6,000 years old with exhibits that depict humans and dinosaurs living together. Attendance at the museum reached more than 400,000 in its first year, but has steadily declined since then.